Surfaces Aren’t As Clean As Expected: One out of every 25 patients acquired at least one infection while in the hospital, with C. diff being the most prevalent. New evidence suggests, according to survey authors, that items like floors, sheets, curtains, and equipment are often contaminated with pathogens, which can lead to these hospital infections. Not surprisingly, high-touch surfaces are the most contaminated. 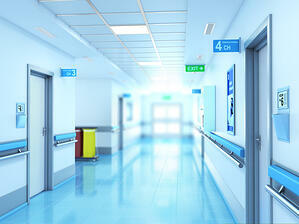 In a test of privacy curtains in a burn unit, more than 87 percent tested positive for MRSA by day 14 after washing. By contrast, freshly laundered curtains in the control group that were placed in an unoccupied staff room remained clean at Day 21. The study also found that facility washing machines failed to remove all traces of C. diff bacteria from linens. Don’t Overlook Your Water Sources: The study also found infection can be spread from sinks, electronic faucets and even decorative fountains. In certain situations, researchers found pathogens were aerosolized while a person was washing their hands and those particles were then transferred to nearby items. Risk factors for spreading pathogens include having poorly placed sinks, storing materials near sinks and disposing of clinical waste in sinks. Personnel Clothing is an Issue, too: Healthcare employees’ scrubs, lab coats, even watches or jewelry can spread pathogens. Healthcare Finance reports that 39 percent of healthcare workers contaminated themselves when the improperly removed personal protective equipment (PPE). While following recommended methods for cleaning are important, it’s also important to use more than one method to monitor the cleanliness of your facility.